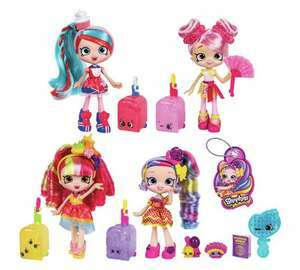 Shopkins Shoppies 4 Doll Pack £33.99 Argos, sell at around £16 per doll! Not for everyone and I am not buying it, but Individually these dolls priced at around £16 each, would be mad to buy 2 when you can get this pack of 4 for £33.99! A very lucky neice! You should maybe first check she hasn't already got shopkins dolls, as if you use your voucher you wont get it back if you need to return! A very lucky neice! You should maybe first check she hasn't already got …A very lucky neice! You should maybe first check she hasn't already got shopkins dolls, as if you use your voucher you wont get it back if you need to return!